This review was created side-by-side with the Canon EF 600mm f/4.0L IS II USM Lens review. These are very similar lenses that arrived at the same time, so you are sure to see many similarities between these reviews. The 500 L IS II is essentially the smaller, lighter, less expensive, wider angle version of the 600 L IS II. Like the 600 L IS II, the 500 L IS II is an incredible lens, featuring outstanding image quality, extremely fast and accurate AF, impressive IS performance and superb build quality. The wait for this lens to arrive seemed like forever. Canon issued a development notice for the 500 L IS II and 600 L IS II nearly two years prior (August 26, 2010). Formal announcement press releases were issued on February 7, 2011 with delivery expected in May 2011. It was not until June 2012 until the first of these lenses were delivered. I sold my being-replaced Canon EF 500mm f/4.0L IS USM Lens and Canon EF 600mm f/4.0L IS USM Lens promptly after the press release to fund the new lenses. I was of course expecting a timely delivery. 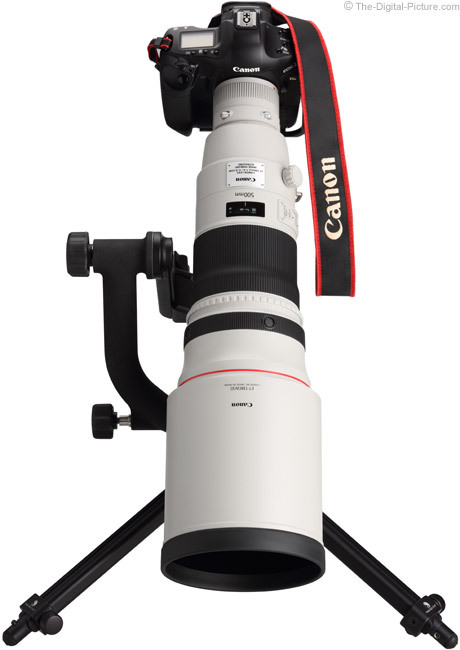 With the long wait over ... the Canon EF 500mm f/4L IS II USM Lens review moves forward. The 500 L II IS replaces the circa 1999 500 L IS I in Canon's line. While there is some resemblance between these two lenses, the II is a complete redesign featuring many significant improvements including noticeably better image quality (hard to believe, I know) and much lighter weight. 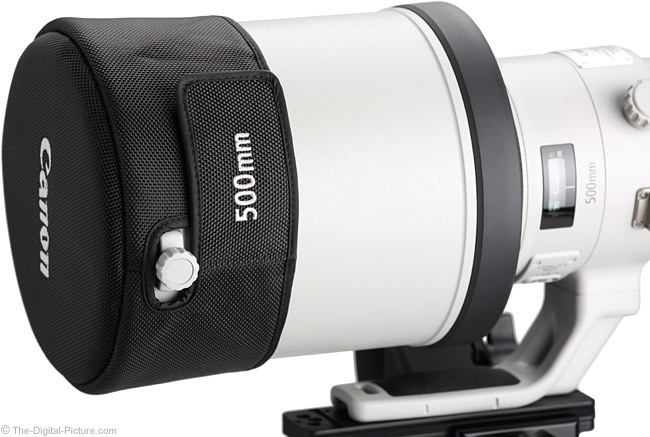 With a 500mm focal length, the 500 L II IS will primarily see use in wildlife, sports, journalism and any other similar long-focal-length-need uses. When used on APS-C/1.6x FOVCF body, the resulting 800mm equivalent angle of view narrows the scenarios this lens will be used for even more. This list of uses very closely matches the 600 L II IS lens' list of uses. As I said in the first paragraph of this review, the primary differences between these lenses is that the 500 is smaller, lighter and less expensive, while the 600 L IS II has a longer focal length. For many of these uses, and especially when using a full frame DSLR, the 600mm focal length is my preference. But the weight difference, for portability and handholding reasons, will most frequently be the reason I choose the 500 L IS II over the 600 L IS II. I'm not saying that I will choose the 500 over the 600 most or more of the time - just saying that weight will be the reason why I will be selecting the 500 over the 600 for certain needs. Before the 500 L IS II and 600 L IS II arrived, I typically used the 600 L IS when shooting from a tripod or monopod and not traveling far from the house or car. The 600 L IS was uncomfortably heavy for longer periods of carrying. I used the 500 L IS for handholding and longer periods of hiking/holding. The 600 L IS II now has a weight similar to what the 500 L IS I weighs, so the lines of use become more blurred for me. Still, the 500 L IS II remains lighter by a noticeable amount. Shooting outdoors with no wind and solid footing, I am able to get a reasonable percentage of sharp handheld results at 1/20th to 1/15th of a second for an easy 4 stops (approaching 5 stops) of assistance. IS testing requires many hundreds of shots - and I work down toward the longer exposures. So my final shutter speeds are determined with a more tired arm. After a discussion I had recently, I'll share a hint about getting good results with image stabilization. First, you need a stable stance with your feet about shoulder width apart. The shutter should be actuated with a slow, steady pressure being applied to the release button. You then need to hold the camera and lens as steady as possible until after the exposure is completely finished. Think target shooting if you are familiar with that sport. Better is to rest against something solid while shooting. I often rest my elbow on my body when using big lenses, but do not do so for IS testing. 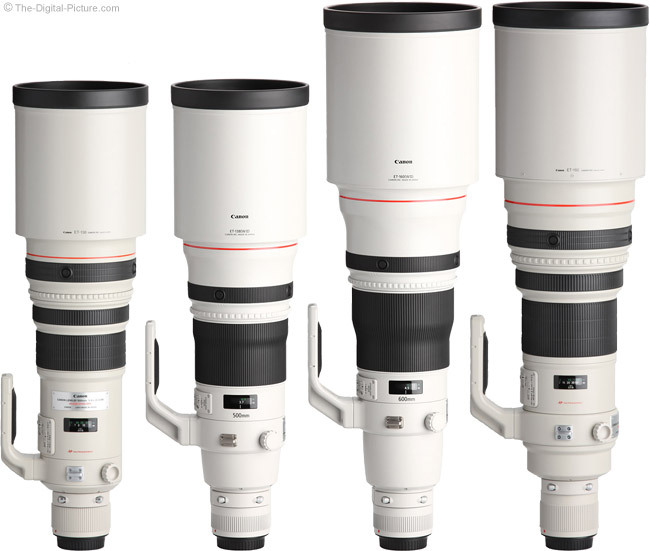 The Canon EF 500mm f/4L IS II USM Lens has three IS modes. Mode 1 is typically used for stationary subjects. Just the stabilized viewfinder this mode provides at 600mm is extremely helpful. The new mode available on IS version II super telephoto lenses is "3". Mode 3 is designed for tracking action. When mode 3 is selected (via a switch - see below), image stabilization is active and ready for use the moment the shutter releases, but actual stabilization is not in effect until that precise time. The view seen through the viewfinder is not stabilized, and you are able to follow your erratic subjects without fighting against image stabilization designed to prevent you from doing the same. IS Mode 3 is designed to detect panning motion. When panning motion is detected, Image Stabilization will only be applied at right angles to the direction of the detected movement (like IS Mode 2). 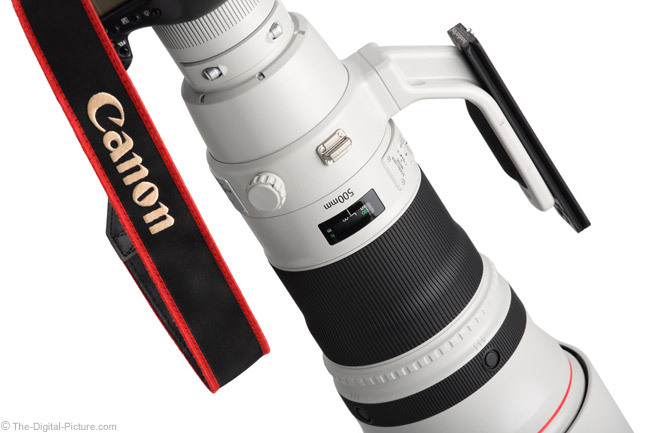 Mode 3 IS was first seen on the Canon 300mm and 400mm f/2.8L IS II Lenses. Using these lenses, I found mode 3 to be to my liking and have made this mode my default action IS mode. I gave mode 3 a significant amount of workout with those lenses and have made mode 3 my standard action setting. As I have said before, off was my previous choice as I usually need a faster-than-handholdable shutter speed to stop the action I am shooting. Mode 3 on the 500 L IS II is working excellently for me. When IS is active, you will hear some clicking and whirring in this lens, but the IS implementation is very well behaved. The image in the viewfinder does not jump around when the system activates/deactivates. In Mode 3, IS sound will be heard when the shutter release is half-pressed, but the image is not stabilized until the precise moment that the shot is taken. I have not used a big white Canon L IS lens that I did not like, so my expectations were of course quite high for the 500 L IS II. 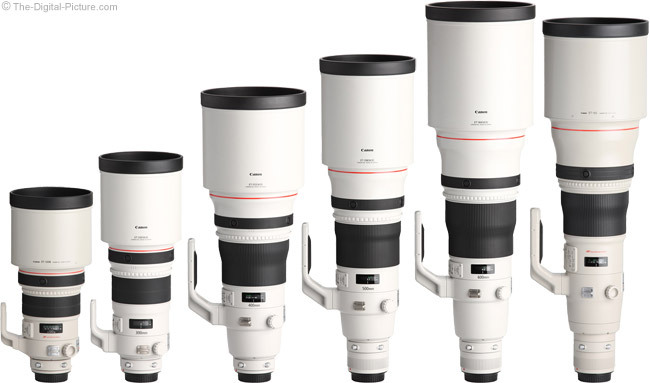 Canon's theoretical MTF charts strongly hinted that the Canon EF 500mm f/4L IS II USM Lens' completely redesigned optics would deliver impressive image quality - as the other version II super-telephoto lenses being released in 2011/2012 have shown. Moving beyond theoretical to what really counts, the Canon EF 500mm f/4L IS II USM Lens performs extremely well in real life. This lens delivers image quality that places it high into an elite class. There is no need to stop this lens down for better sharpness/contrast - the Canon EF 500mm f/4L IS II USM Lens is extremely sharp at f/4 - right into the full frame corners. Stopping down to narrower apertures makes very little difference in resulting image quality - other than some vignetting clearing in the corners. I tested two retail-purchased 500 f/4L II IS lenses. They performed very similarly - results from both are included in the ISO 12233 chart tool (link at the top of this review). The 500 L IS II shows itself especially impressive when compared to the also-sharp 500 L IS I Lens. The contrast/sharpness difference between the new and old lenses is quite noticeable. About 1.6 stops of vignetting is present in full frame corners at f/4 - an amount very similar to the 500 f/4 IS I. A barely-perceptible .6 stops of vignetting remains at f/5.6 and essentially no vignetting remains at f/8. APS-C body owners will not likely notice any vignetting - even at f/4. The 500 f/4L II IS is essentially distortion-free. CA (Chromatic Aberration) is very well controlled showing slightly less than the 600 L IS II and about the same as the 400 L IS II. The II lenses have proven to be far greater resistant to flare than the I lenses, but don't expect a standard 500mm flare test from me. Don't point this lens into the sun, but do expect better backlit-subject performance from the version II lens. The 500 L II creates a nice quality background blur (bokeh) and delivers a solid amount of blur due to the long focal length and wide (relative to that focal length) aperture. Like it's big white L IS II siblings, the 500 IS II has a 9-blade circular aperture. The SWC coating works. Along with the reduced flare, this lens turns in very impressive contrast and great color - even at f/4 - as seen in the other similar lenses. The Fluorine coating benefit is easy to see from a cleaning standpoint - fingerprints specifically are much easier to remove from a lens coated in this manner. I rarely use these lenses without the hood, so getting fingerprints onto the front lens element takes concerted effort. Dust does get blown into the large lens hood hole - and cleaning the dust from the Fluorine-coated front lens element is very easy. Like the rest of the Canon super telephoto lenses, the Canon EF 500mm f/4L IS II USM Lens turns in phenomenal AF performance. Driven by Ring USM (Ultrasonic Motor), the 500 L IS II focuses extremely fast and very quietly. Some quiet shuffling movement can be heard inside the during focusing. The 500mm f/4L II IS's manual focus ring is very large, is nicely damped, has a very nice rate of adjustment and is very smooth with no play. The subject size in the viewfinder changes slightly over long focus pulls, but most of the size change is related to the subject turning into a blur. The change in focusing in this lens is solid and predictable. Turn the ring slightly to get the low speed electronically-driven AF and turn it to a greater degree to obtain the higher speed. Low speed is hard to catch before moving into fast speed, and fast speed seems too fast to be usable to me. The direction of ring rotation determines the direction of focus distance change. The feature works properly, but as I've said before, you are going to need a solid tripod setup and a steady hand to not induce movement while turning the ring. The electronic focusing is very quiet, but image stabilization needs to be turned off if recording sound at the camera. A 3-position focus limiter switch allows focusing distances to be limited to a specific distance range - or to be unlimited: 12.1' (3.7m) - 33' (10m), 33' (10m) - ∞, 12.1' (3.7m) - ∞. Limiting the focus distance range can improve focus lock times and reduce focus hunting. Canon's super telephoto lenses are renowned for their autofocus performance. These lenses are relied on by the world's best photographers shooting the world's biggest events. Especially with shallow depth of field that long focal length, wide aperture lenses can create, focus accuracy is critical. In One Shot focusing mode, the Canon EF 500mm f/4L IS II USM Lens focuses extremely quickly and very accurately. When I do my part, this lens is turning in almost no out of focus images. The lens' focusing speed is also highlighted in AI Servo mode where it is able to track fast moving subjects at even close distances. While I intend to use this lens for athletic events, my spring sports season ended about a week before this lens arrived. I went for the ever-challenging galloping and cantering quarter horses to test the 500mm f/4L IS II Lens' AI Servo AF capabilities. The closer and faster the subject is moving, the harder it is for a camera and lens to drive AF fast enough to maintain focus. 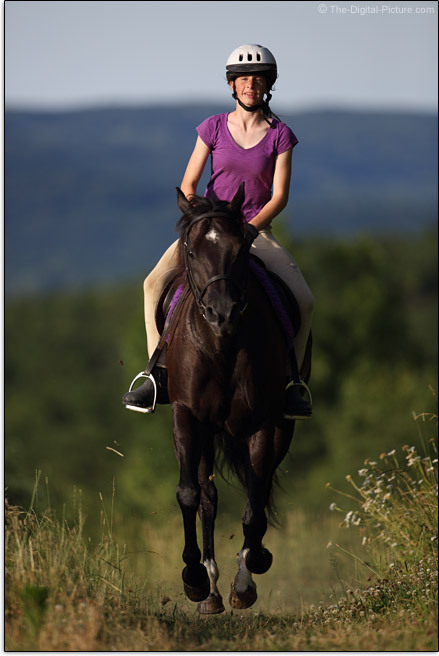 A galloping quarter horse at a small-rider full-frame-filling distance is very challenging (challenging for me also). The 5D Mark III settings for this shot were 1/1600, f/4 and ISO 320. The RAW image capture was processed in DPP using the Standard Picture Style with no adjustments made other than sharpness being reduced to only "2". Since the shot will be framed too low even with a peripheral 5D III AF point placed directly on the rider's eyes, I am generally placing a peripheral focus point around the shirt collar for these shots. You will see that the chin strap and ears are slightly better aligned with the sharp plane of focus than the eyes, but the eyes are still sharp - that's what counts. The 500 f/4L II IS delivered very sharp eyes over and over again. 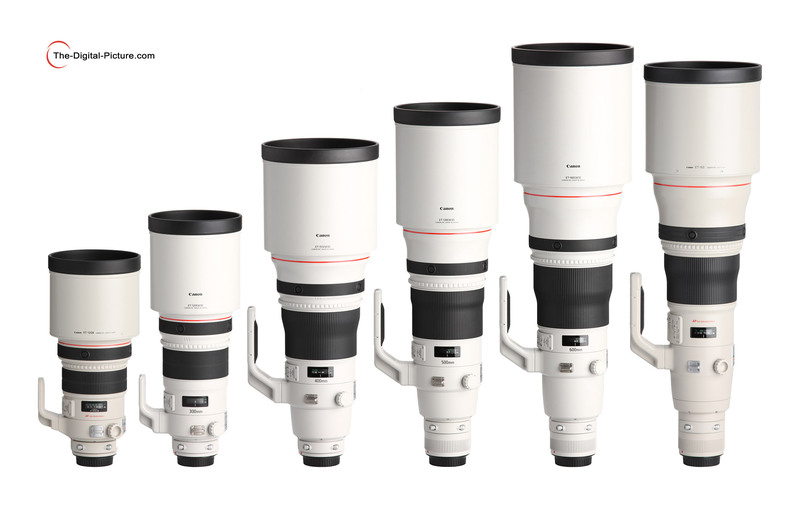 Canon super telephoto lenses all have long MFDs (Minimum Focusing Distances) - even relative to their focal lengths. The 500 f/4L II IS brings us a welcomed improvement over its predecessor by focusing 31.5" (800mm) closer. The resulting new MM (Maximum Magnification) value of .15x is still nothing to write home about. Carry a 25mm extension tube or 1.4x extender when hunting for close-ups of small subjects. All Canon super telephoto lenses are compatible with the Canon EF 12mm Extension Tube II and the Canon EF 25mm Extension Tube II. Using the ETs improves the 500 IS II's MM specs to .18x and .22x respectively. As always, infinity focus distance is lost when ETs are mounted. 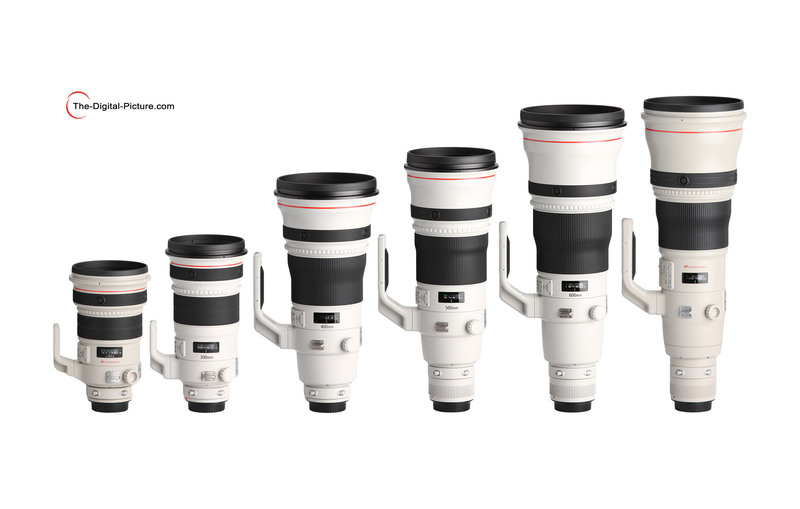 All Canon super telephoto lenses are compatible with the Canon Extender EF 1.4x III and the Canon Extender EF 2x III. 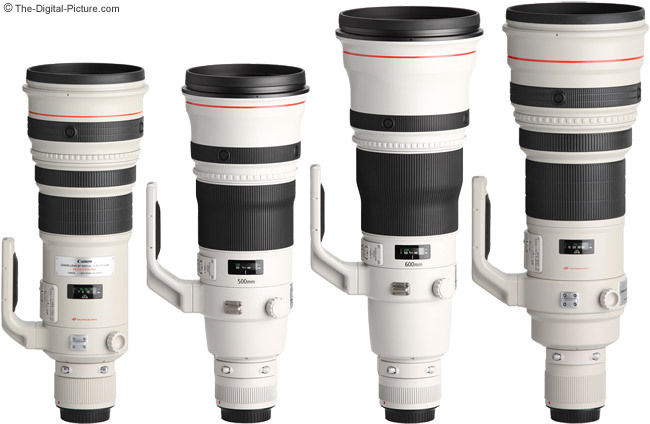 The resulting lens combinations are impressive - 700mm f/5.6 IS and 1000mm f/8 IS lenses. 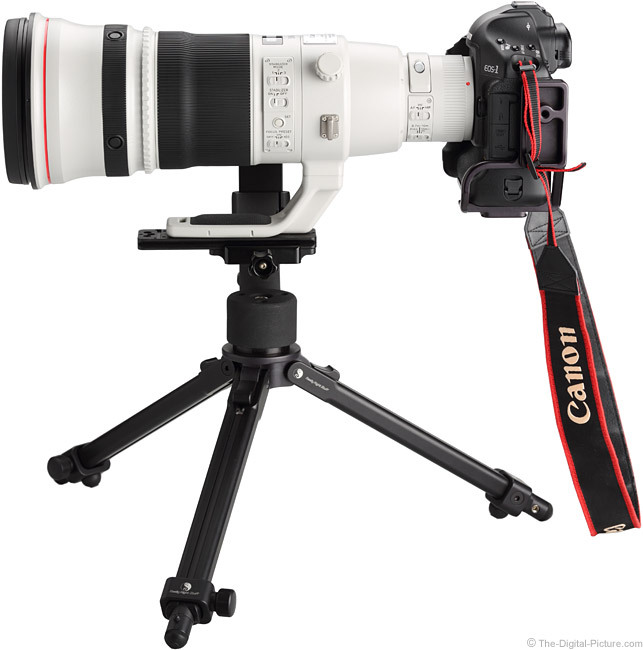 Full frame Canon EOS DSLR camera owners will find the 1.4x III extender an especially useful accessory for bird and small animal photography. When mounted behind the 500 f/4L II IS, the 1.4x III very slightly reduces wide open aperture contrast/sharpness and slightly increases barrel distortion. Stopping this combination down to f/8.0 results in only very slightly better image quality. Adding the 2x III Extender to the 500 L IS II impacts sharpness/contrast more substantially. A 1-stop narrower aperture results in only slightly improved image quality - and the aperture is now f/11 in this case. Little distortion is present with this combination. With an f/8 max aperture, the 500 + 2x combo will autofocus only Canon 1-Series bodies (as of review time) - and only using the center AF point. Update: the Canon EOS 5D Mark III is expected to receive a firmware update to allow it to join the 1-Series bodies in the f/8 AF capability. Like the rest of the Canon super telephoto lenses, the Canon EF 500mm f/4L IS II USM Lens is built extremely well. As a lens that will be primarily used outdoors (and will be frequently traveled with), this build quality is critical. 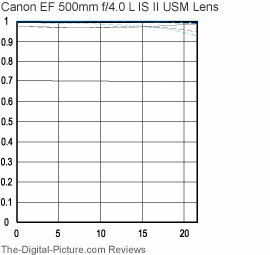 To that end, Canon indicates that the 500 L IS II has "double the impact resistance" over the 500 L IS I lens. Also like the rest of the Canon super telephoto lenses, the 500 f/4L IS II is weather sealed. "Weather-sealed EF lenses are not immersible, but they can handle rain with no problem." [Canon USA] The sealing of the new IS II super telephoto lenses "... is equivalent to the older IS super-telephotos." 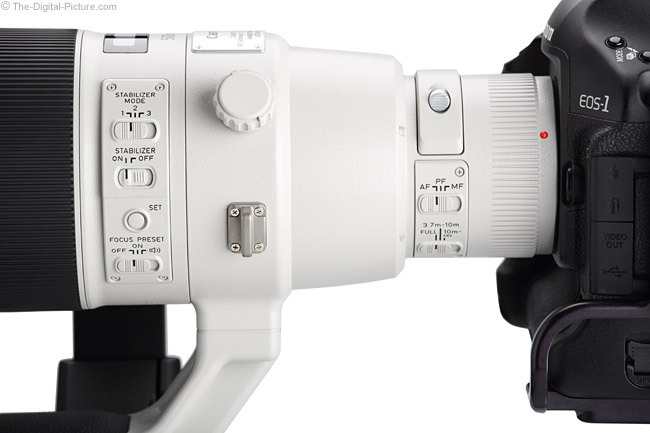 According to Canon USA, the overall durability of the 500 f/4L II IS over the previous model has been enhanced through increased usage of robust and lightweight magnesium alloy and titanium for lens barrel components. The 500 f/4L II IS looks very similar to its version II siblings - just with a different size. For many more comparisons, review the complete 500mm f/4L II IS Specifications using the site's Lens Spec tool. While it did not lose the weight percentage that the 400 L IS II and 600 L IS II lenses lost, losing 1.5 lbs (680g) definitely makes the 500 L II IS even more portable and handholdable than its predecessor. This is a very welcomed change. It will make a real difference in your experience - and therefore, quite possibly, in your shots. Looks like I'll not be able to leash the kids to this one as with the predecessor. Like most of Canon's super telephoto lenses, the 500L II IS utilizes 52mm drop-in filters. Included is a drop-in gel filter holder with a glass filter installed. This glass filter is also helpful in catching dust before it drops deep inside the lens. A Canon 52mm Drop In Circular Polarizer Filter is available. The image above shows most of switches and buttons discussed in the Canon EF 500mm f/4L IS II USM Lens review. 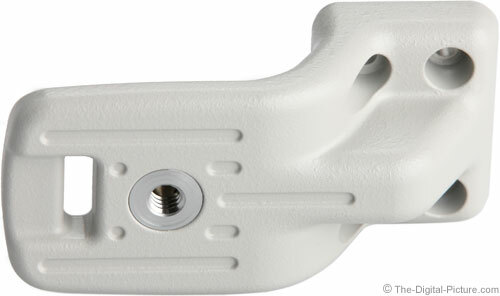 Also shown in this image is one of the two attachment points for the included lens neck strap - which is shown below. The lens strap attaches to the tripod ring, which allows the camera to be rotated without the neck strap following the rotation. 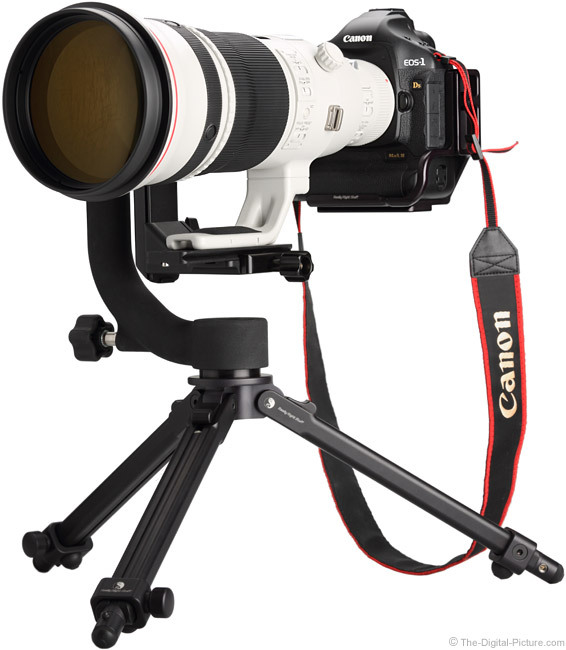 The 500 L II IS tripod ring has been updated over the previous version. It is now stronger, smoother and again features 90° detents for perfect framing orientation. Two tripod ring feet are included for use on tripods or monopods - the monopod foot is delivered as the optional attachment and is shown above. I use the originally-installed padded (for carry comfort) foot for all of my uses. This foot has two differently-sized threaded inserts (1/4" and 3/8"). As you see in the product images on this page, I have a Wimberley P50 Lens Plate attached to my Canon EF 500mm f/4L IS II USM Lens for quick attachment to my Arca-Swiss compatible monopod and tripod head clamps. This long plate also provides a longer range of balance adjustment. Note that this setup requires a bushing/thread adapter to allow the two same-sized screws to be properly attached (two screws prevents twisting of the lens plate). The 500 L IS II is a great choice for times when portability and handholdability are required, but this is is still a large lens that will become uncomfortable to hold/carry over time. A solid tripod or monopod makes life with this lens easier. With a lens this large, tripod head selection is also important. You also need to be aware that, even when using a quality tripod head such as the Arca-Swiss Z1 that is rated to hold extreme weights, lens flop can easily occur when such a lens is mounted. When adjusting the tripod head, a heavy lens can quickly fall forward - which then can topple the entire tripod - resulting in a potential disaster for the mounted gear. I highly recommend using the superb Wimberley Tripod Head II with this lens. When properly attached to the Wimberley Head, the 500 f/4 IS II can be positioned using only a finger or two. This is the tripod head seen in the product pictures throughout this review. I most often use only a quick release clamp on my monopod. Canon super telephoto lenses come in a nice, very protective, lockable (keys included) lens trunk. The IS II cases are redesigned with a nice, more-modern appearance. 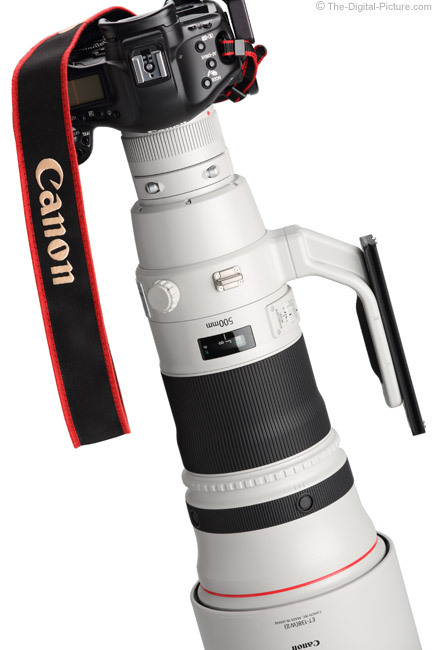 Here is the Canon EF 500mm f/4L IS II USM Lens' Canon Hard Case 500B. The 500B is a very large case, measuring about 13 x 10.5 x 24" (330 x 267 x 610mm)(DxHxW) and weighing more than the lens - 9.6 lbs (4.35kg) empty. The 400 L IS II, 500 L IS II and 600 L IS II hard cases share the same design with different inserts provided for a custom interior fit. These cases all stack neatly for storage - but new models do not stack with old models. 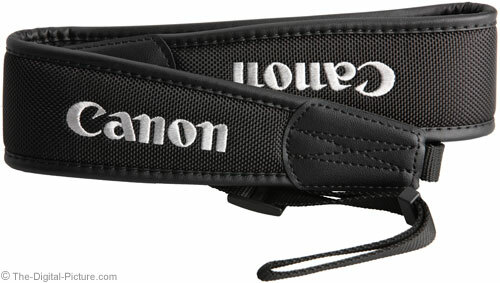 Like the Canon Hard Case 400C, the Canon Hard Case 500B is oversized for the lens. Storage for extenders is provided, but ... I'd rather have a smaller case. 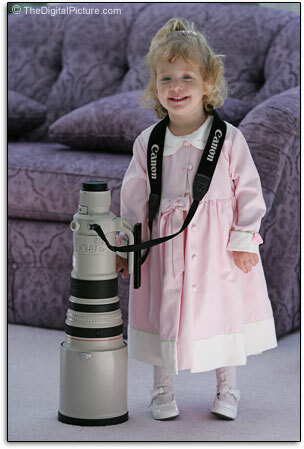 Or, give me room for a pro DSLR instead. The lens always needs a camera, but not always extenders. The hard cases are nice for storage and are very protective, but I find some of the other manufacturer's soft cases to be more practical for my uses (such as some of the smaller Nikon super telephoto lens cases). 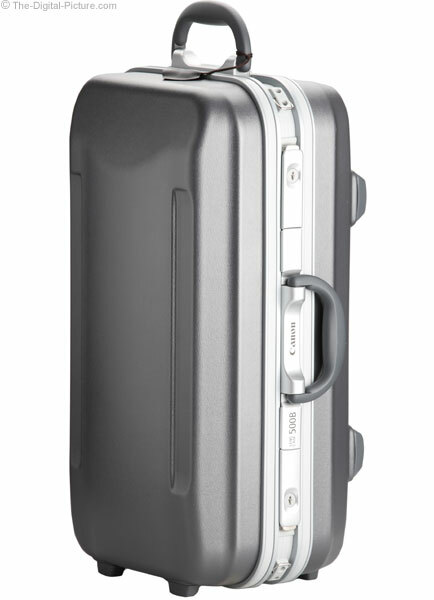 The 500B case comes with a removable shoulder strap as seen below. Unlike the 300 L IS II and the 400 L IS II, the 500 L II IS comes with a conventional paper manual in the box. The last two big white IS II lenses I received included a CD with all of Canon's lens manuals in PDF format - my preference. Update: The 500 L IS II owner's manual is now available for available for download - you will find the link for doing so at the top of this review. 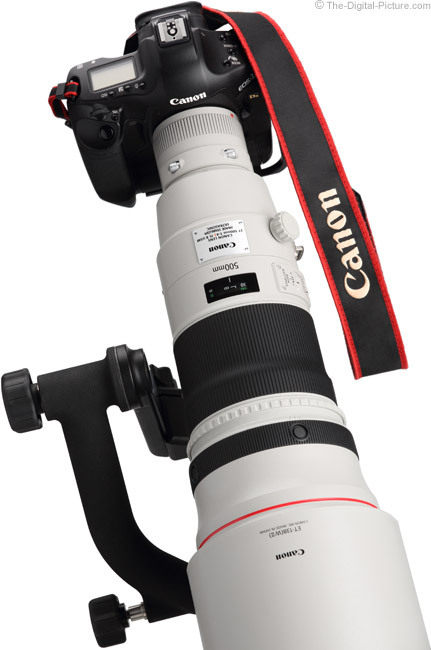 For the uninitiated, the Canon EF 500mm f/4L IS II USM Lens' price tag is going to be a bit shocking. The price may fall over time, but it may also go up - this lens' price went up $1,000.00 from when it was first announced until it hit the streets. Such price increases along with strong used product demand historically have made the high Canon super telephoto lens price tags much easier to tolerate. It is very possible that you could use one of these lenses for 7 years or more and sell it for a price similar to what you paid. I was able to make a nice profit on my 500 f/4L IS - and I sold it for a very fair price - and I sold far too early for the best price. As always, if the price makes the 500 f/4L II IS unobtainable for you, consider renting one for your special events/trips. Like I said in the 600 l IS II review, those purchasing the 500 f/4L II IS will be professionals and serious amateurs - and they will likely have a specific subject type in mind for its use. And the subject types will likely be the same as the 600 L IS II will be used to capture - here are the typical ones. A high percentage of 500 L IS II captures will be of birds and other wildlife. These subjects typically need as much focal length as you can get and 500mm is a nice number in this regard. Another high percentage of 500 L IS II captures will be from sporting events. There are better lens choices for close sports action - these include the Canon EF 70-200mm f/2.8L IS II USM Lens and the Canon EF 300mm f/2.8L IS II USM Lens. These wider lenses nicely complement the 500's ability to reach far out for the action. The 500 L IS II will be frequently seen capturing amateur, collegiate and professional large field/track/mountain/water/air sports action. Think football, soccer, baseball, rugby, golf, snow skiing, surfing, motorsports of all kinds, cycling, air competitions, yachting and a huge list of other active events. Photojournalists and law enforcement agencies will take another significant percentage of 500 L IS II captures. This lens will allow photojournalists to stand behind crowds and still create tightly framed shots of the event they are covering. While I'm not sure that I would buy this lens just for landscape photography, it performs very well in this use. The compressed landscape look is what a 500mm focal length delivers. Bringing in distant mountain peaks is one example of 500mm landscape use. 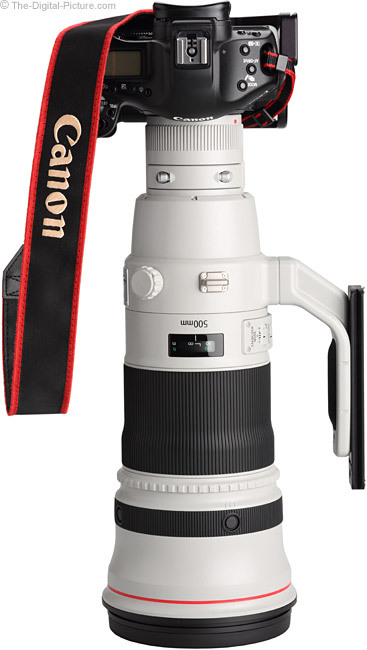 What are the alternatives to the Canon EF 500mm f/4L IS II USM Lens? The two closest alternatives in the same price and quality category as the 500 L IS II are the Canon EF 400mm f/2.8L IS II USM Lens and Canon EF 600mm f/4.0L IS II USM Lens. All three of these lenses deliver amazing image quality. With an in-between focal length, the 500 L IS II is noticeably smaller and lighter than the other two. It is also less expensive. The 400 has an important-for-low-light-action 1-stop wider aperture. The 500 is usually going to be the better choice for you if handholding and carrying for long periods of time. 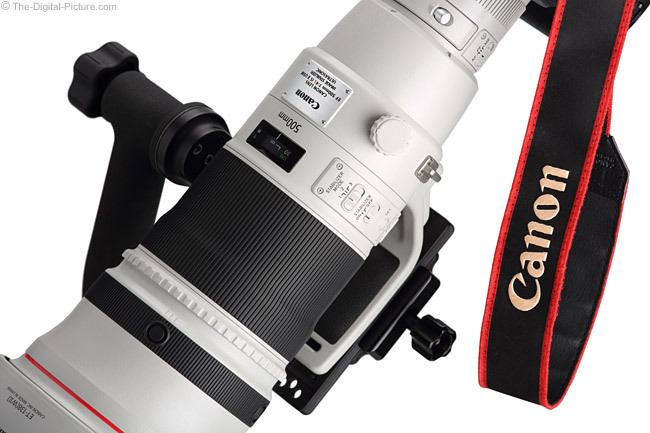 For a lighter option, consider the Canon EF 300mm f/2.8L IS II USM Lens and extenders. If you are not able to reach the super telephoto budget, Canon's more affordable professional grade 400mm lenses, including the Canon 400mm f/5.6L USM Lens and Canon EF 100-400mm f/5.6L IS USM Lens, will be your longest focal length Canon lens option. To say that I'm very happy with the 500 L II's AF performance would be an understatement. As with the 400 L IS II and 600 L IS II, a majority of photographers are not going be able to afford this lens. This fact combined with the exceptional image quality and AF performance this lens delivers means that, in competent hands, the Canon EF 500mm f/4L IS II USM Lens will deliver differentiating results.